Lothian Car Club ( Edinburgh ) Limited, a Company Limited by Guarantee was Founded and Incorporated on the 8th of September 1948 to promote motorsport and motorcycle racing. The Club promoted Speed Hill Climb, Sprint and other forms of Motorsport Competition for many years including Bo’ness Hill Climb until a housing estate was built on the top section of the track. 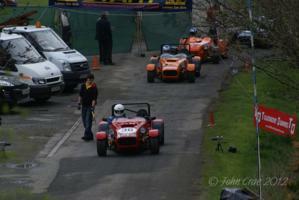 The major development was the commissioning and building of the Speed Hillclimb Course at Doune in 1967/1968. 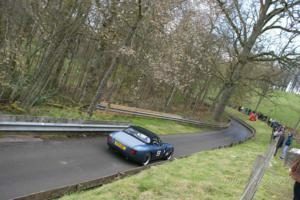 The Doune Speed Hillclimb Course is recognised as one of the sports premier venues “The King of Hills” in Britian and hosts two rounds of the British Speed Hillclimb Championship and four rounds of the Scottish Hill Climb Championship annually. The Course was designed by Ray Fielding and is of 1350metres in length. It has been altered in length twice since 1968 and today is 30 metres less than the original distance. The first event was held in April 1968 and Raymond Mays opened the course in June of that year. The Hill was resurfaced in January 1992, a new paddock established in 2000 and a Paddock ring road installed in 2002. The first Hill record was set by Sir Nicholas Williamson driving a Brabham BT21C in June 1968 at 48.84 seconds. Average Speed 61.82 mph. The current record set on 22nd June 2014 is held by Scott Moran driving a Gould 3.5L GR61x NME and stands at 34.76 seconds. The Club has won the Hillclimb and Sprint Associations Award for the best organised Event of the Year on a number of occasions.